Making dogs' tails waggle is second nature at Good Boy pawsley & co. We produce really exciting, yummy treats to keep your dog happy as well as entertained. 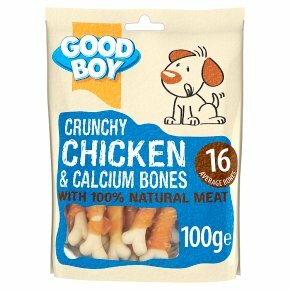 These Crunchy Chicken and Calcium Bones are made with super duper tasty 100% natural chicken breast meat so are sure to become one of your dog's favourite treats. Lovingly packed in a handy, re-sealable bag, as well as being lip smackingly tasty they are full of natural goodness too as they are; Made with 100% natural human grade chicken breast meat Only 1% fat Wheat and cereal free - ideal for sensitive tummies Contain no artificial nasties such as colours or flavours With calcium to promote healthy teeth and bones What's more, the crunchy texture also makes these tasty little treats great for your dog's dental hygiene. Its simple really, all dogs like to chew - it's a natural instinct. Chewing can not only provide your dog with stimulation but more importantly it may help reduce the risk of gum disease and tooth loss by help keep your dog's jaws strong and teeth clean. What's not to love?